This standard describes actions that the owner of a nuclear power plant shall take to prepare for and respond to a felt earthquake at the plant(s), including the need for plant shutdown; actions to determine the readiness of the plant to resume operation; and those evaluations necessary to verify the long-term integrity of safety-related and important structures, systems, and components. It also includes a consensus definition of operating basis earthquake exceedance, beyond which U.S. regulations require plant shutdown. 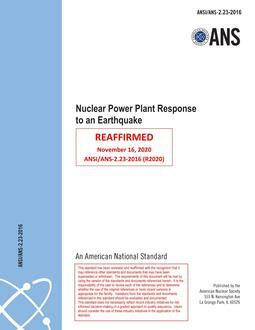 Application of this revised standard provides a comprehensive, balanced plan for the response of a nuclear power plant to an earthquake. This standard does not cover those operator actions that are performed in connection with safe operation and control of the nuclear power plant during and following an earthquake. These operations are specified in plant operating procedures, emergency procedures, alarm response procedures, and other conditions of the plant's license. Likewise, it does not cover required reporting and communications with the U.S. Nuclear Regulatory Commission. It is not applicable to nuclear facilities other than licensed nuclear power plants.